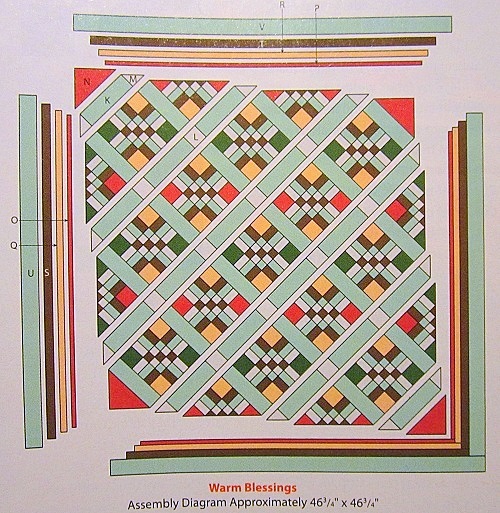 my Warm Blessings quilt … there is a slight boo boo in the quilt assembly diagram in the magazine. 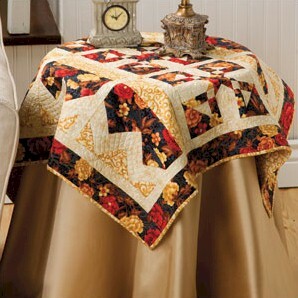 This is what you will see in the magazine. 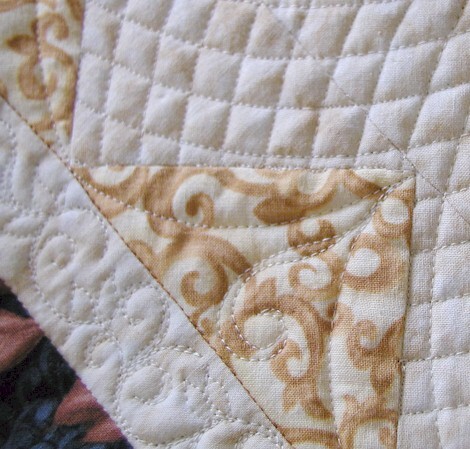 See how the brown patches in the 9-patch block centers are all going in the same direction? 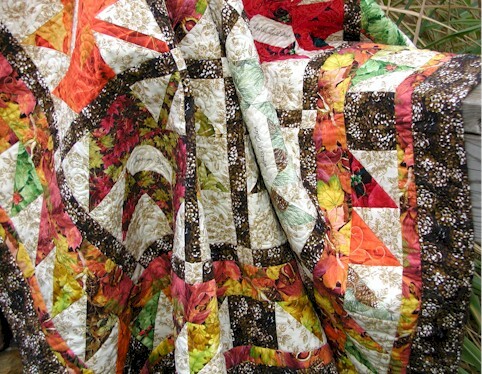 That’s not the case in my original design with which I made the quilt. The difference is subtle, and probably won’t matter much. 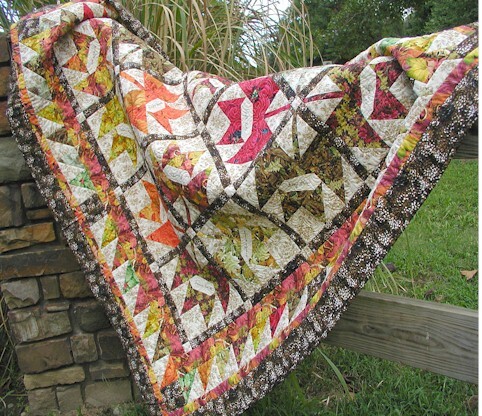 But I felt like it is my responsibility to share the information with you in case you are wanting your quilt to look EXACTLY like mine. 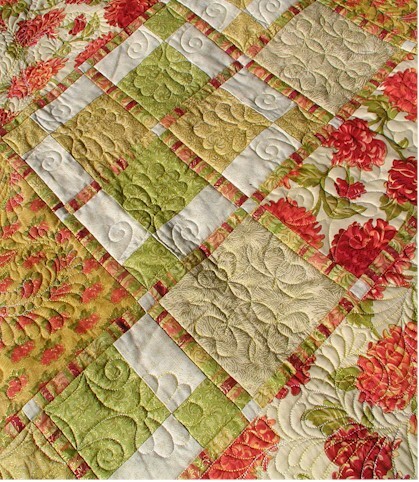 I also feel the braided effect is a little more prominent with the brown patches oriented differently from block to block. 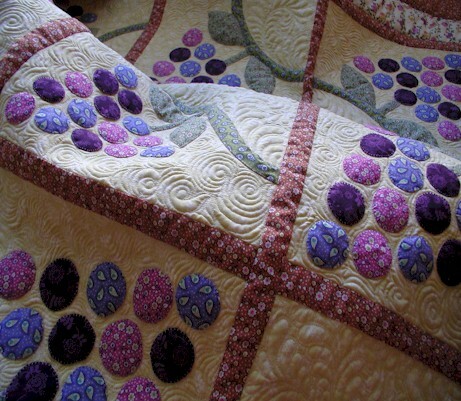 I want to also take the opportunity to thank you for your super kind and sweet comments on the quilt. Have a blessed rest of the day. 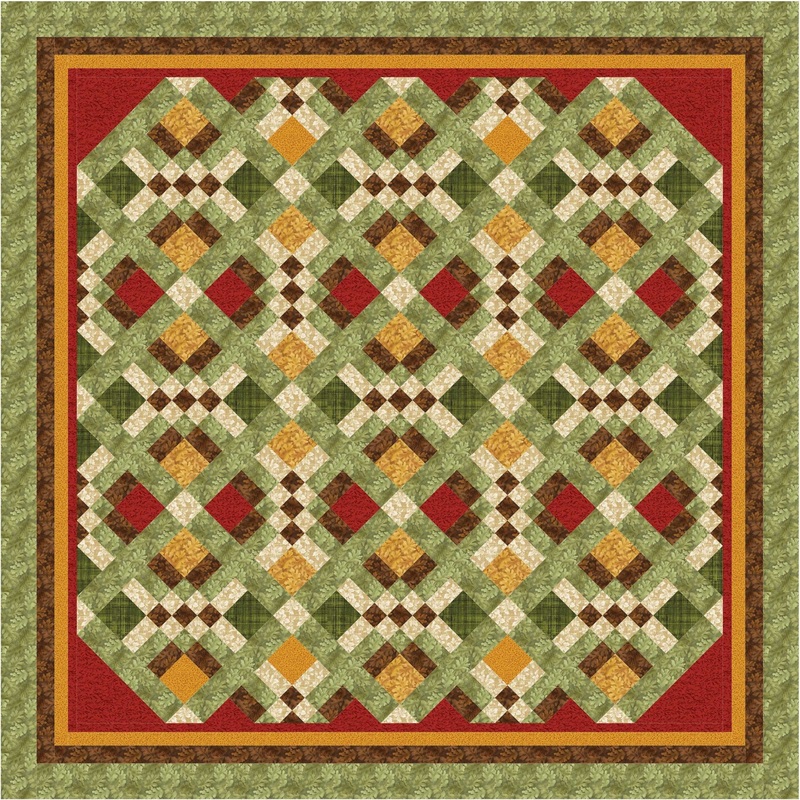 UPDATE 1/28/2013: CLICK HERE FOR REVISIONS ISSUE BY QUILTER’S WORLD. Hello Friends! 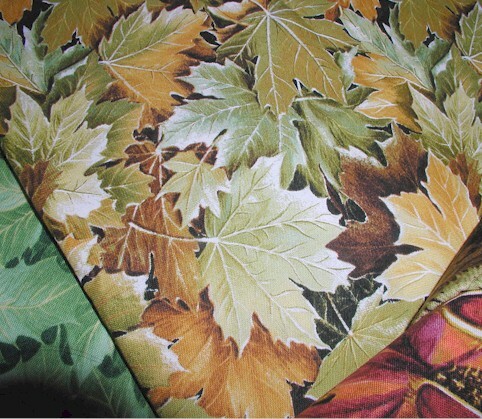 I hope my post finds you well. 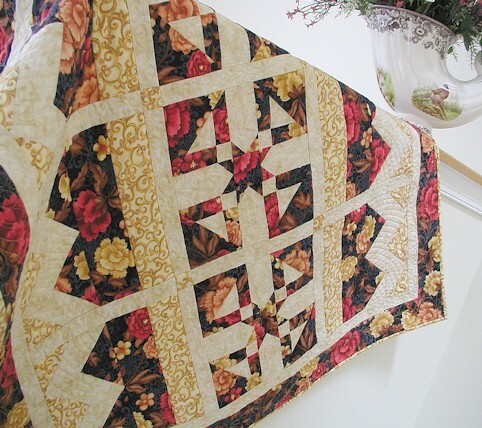 I received my Mums the Word quilt back from the Editor. 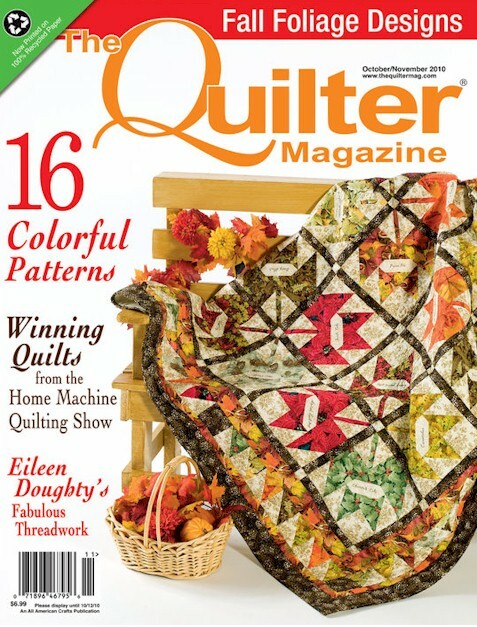 The quilt is featured in the latest (October/November 2011) issue of The Quilter. 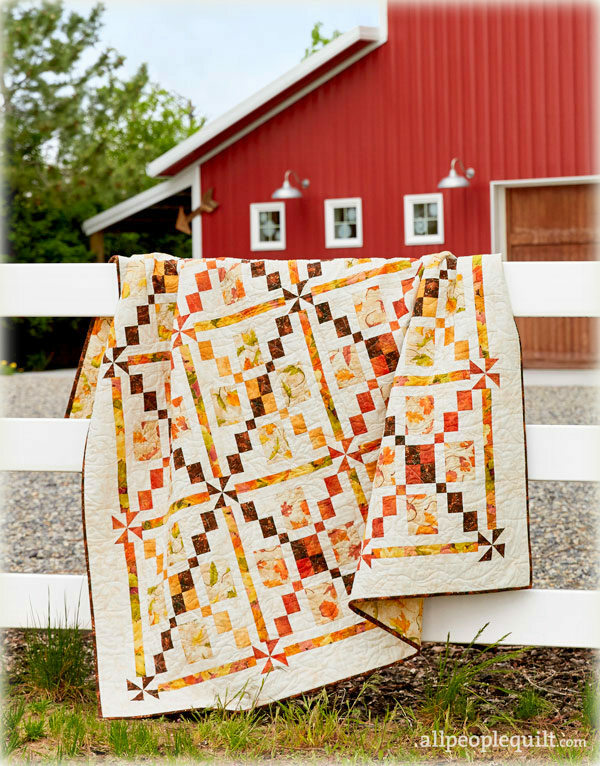 The construction of this quilt is quite straight forward – only squares and rectangles, even though some of the squares are as little as 1/2″ finished. 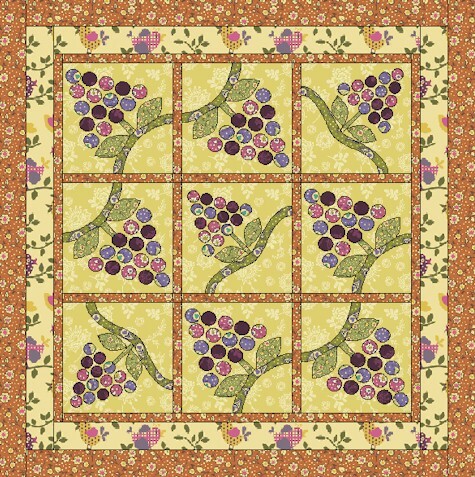 I wanted a panel look for the quilt to highlight the beautiful fabrics in the beautiful Northcott‘s Mums the Word collection. 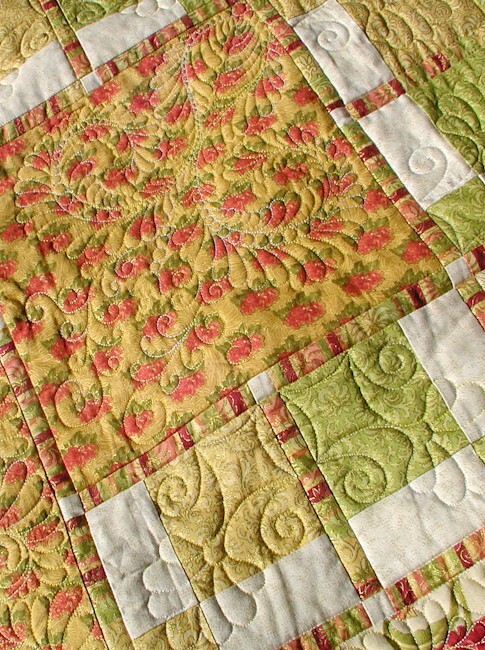 I quilted a mixture of feathers and stencil motifs on this quilt. 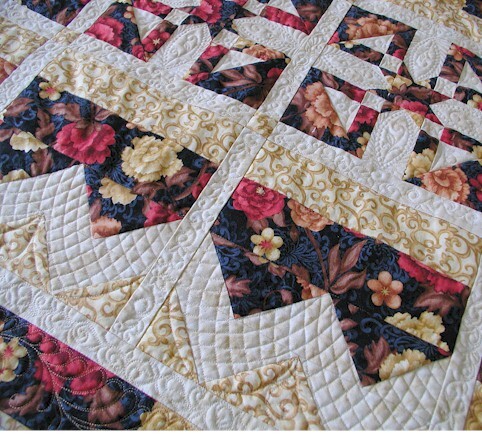 Where the panel blocks are geometric and regular, I traced stencil motifs onto the blocks before quilting. 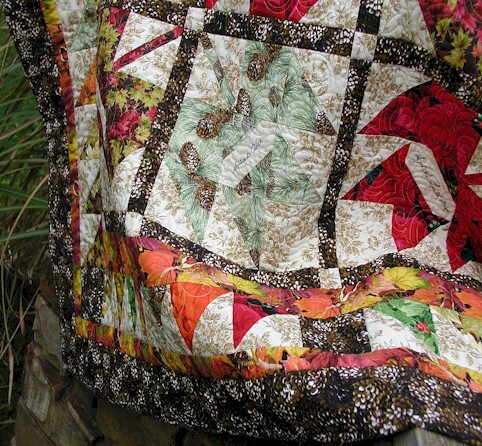 I then quilted feathers in the larger blocks and rectangular areas. 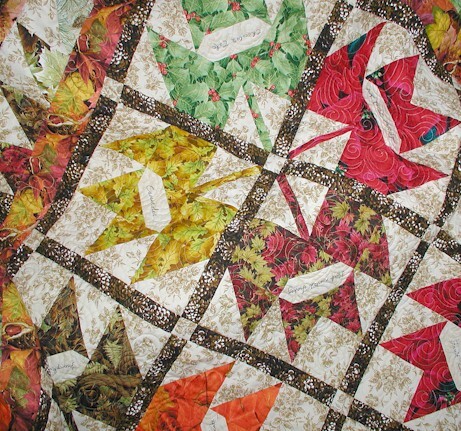 I used a modified mark without really marking method to quilt the feathers in the large blocks to achieve a uniform look. 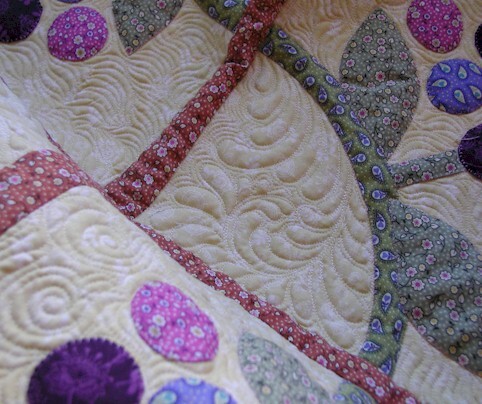 Except for marking rough placements of the spines of the remaining feather plumes, everything else was free-handed. 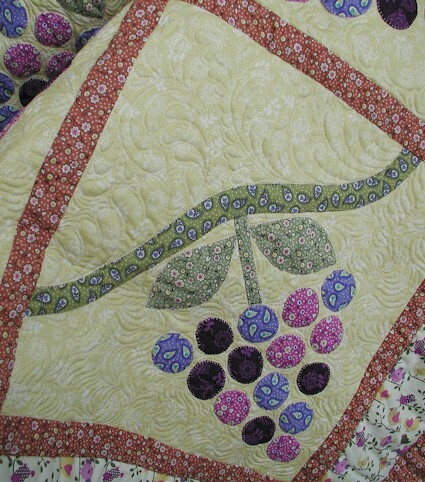 In fact you can see on the back better what I meant by my mixture of stenciled motifs and feathers. 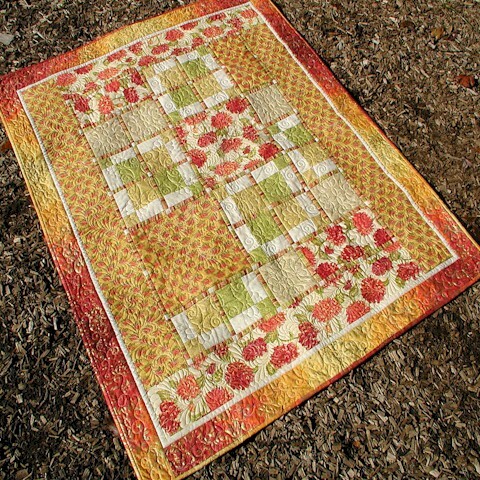 Quilting was done with Aurifil Mako 50 Cotton (Color 2310) over Hobbs Tuscany Silk batting. Thanks for stopping by! 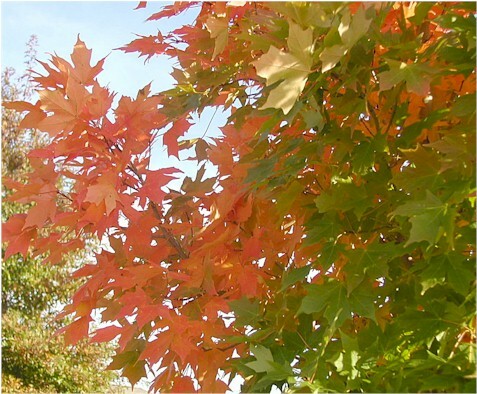 Have a glorious autumn day! 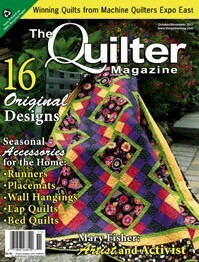 It’s mind boggling enough to think that quilters in the other parts of the US saw my quilt when the magazine came out. 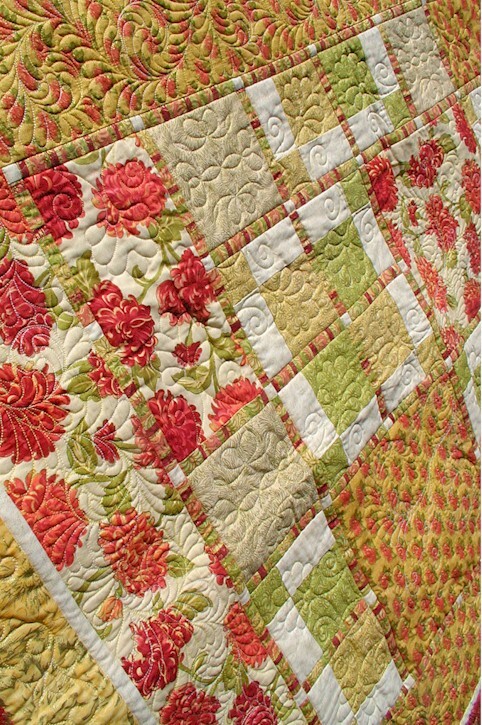 Now my little pea brain has a hard time wrapping around the concept of quilters in Australia saw the quilt too! 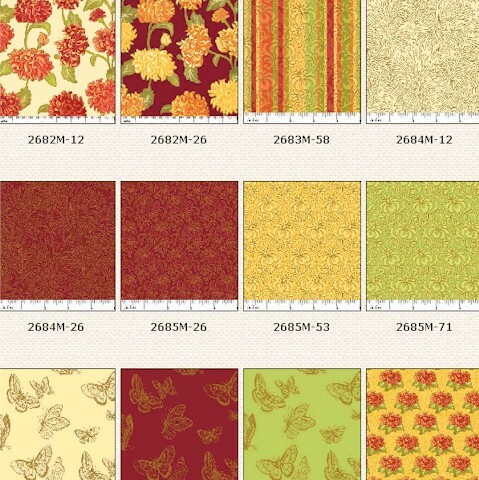 Is the world truly that small after all? 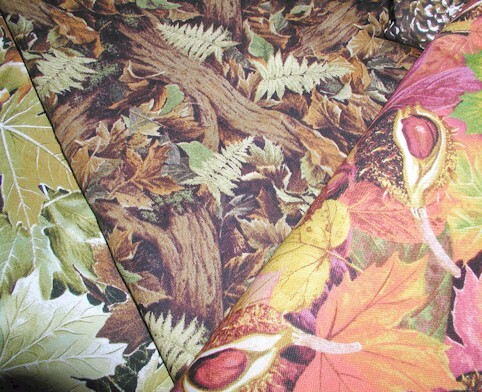 Fall is a favorite season in my household. 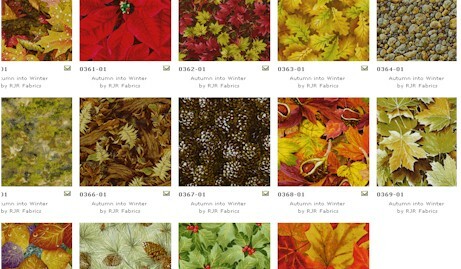 So I jumped at the opportunity to work with RJR‘s Autumn into Winter fabric collection. 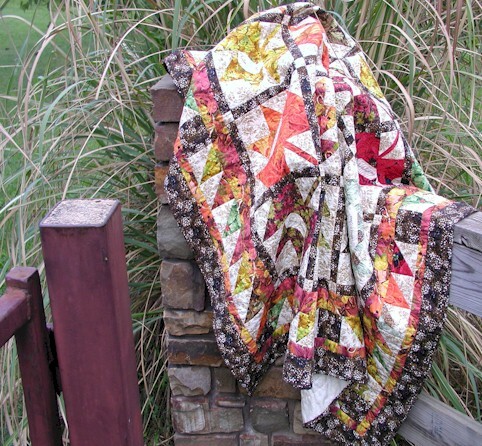 I used just about all the fabrics in that collection to achieve a scrappy look even though the fabrics are from the same collection. 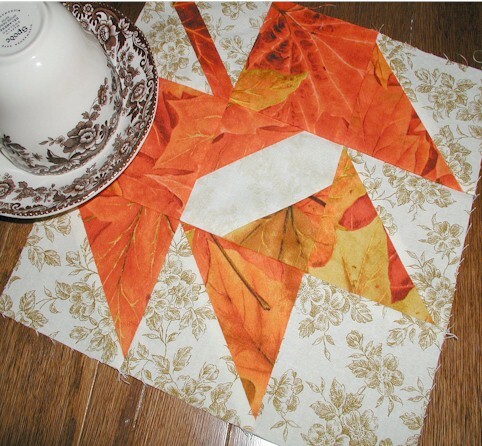 The blocks are the popular maple leaf block, with a “signature” twist. 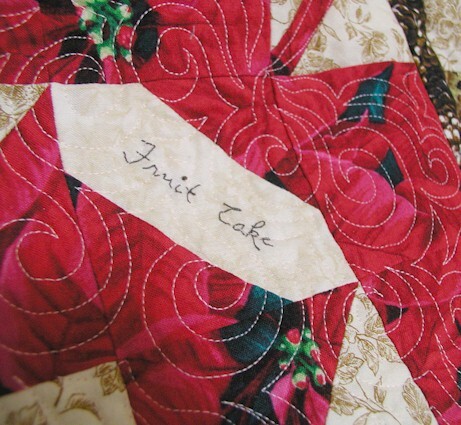 Instead of stitching and commemorating names of people, I hand stitched popular food items we enjoy in the cold months of the year on each block. 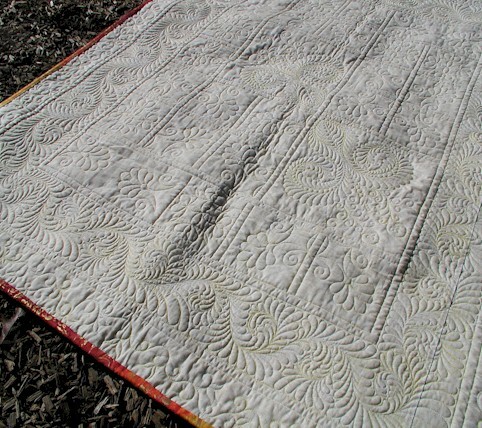 Quilting was done free-motion on my domestic machine. 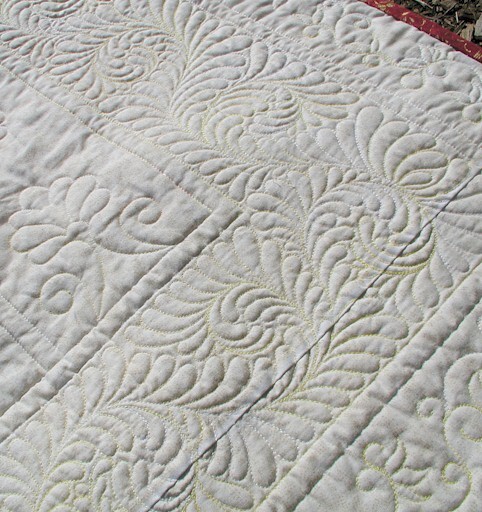 I quilt all my quilts on my Bernina 640E. 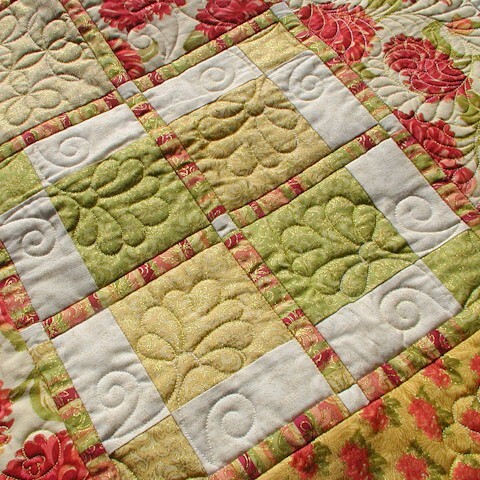 I used Aurifil Mako 50 threads of different colors to match the main color of each block for quilting. 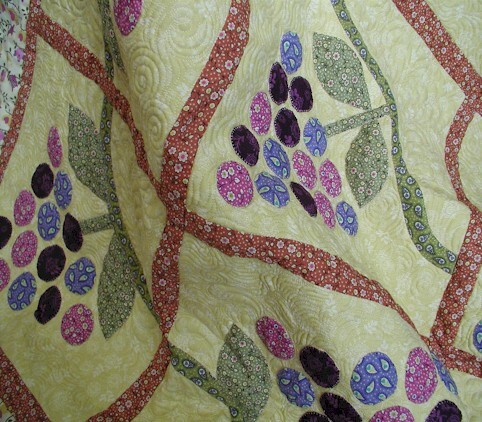 Using Hobbs’ Tuscany Silk Batt makes my quilt soft and cuddly. 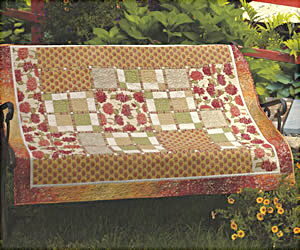 This quilt will be treasured in our household because it will memorialize the comfort of food in our family for many many years to come. Thank you for stopping by. 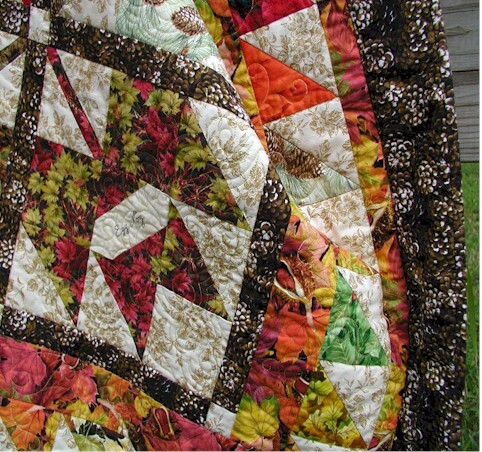 I hope you have enjoyed the Bloggers Quilt Festival. 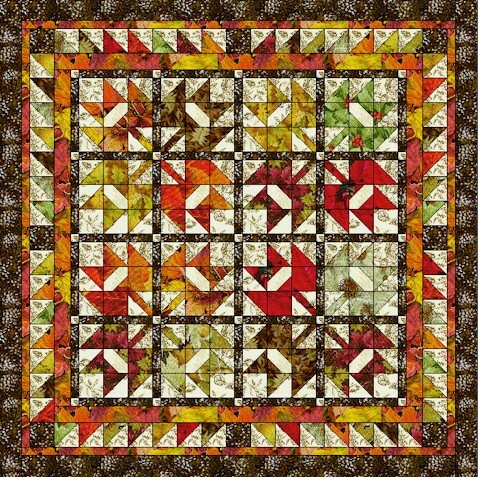 Should you feel like viewing more fall quilts I have made this year, here are the links: Fruit of the Vine, Cascade of Leaves. 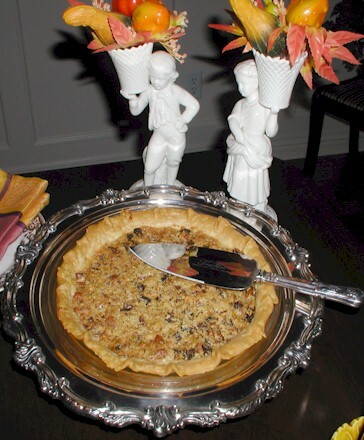 You may also click here for my Japanese Fruit Pie recipe – a favorite at our house. 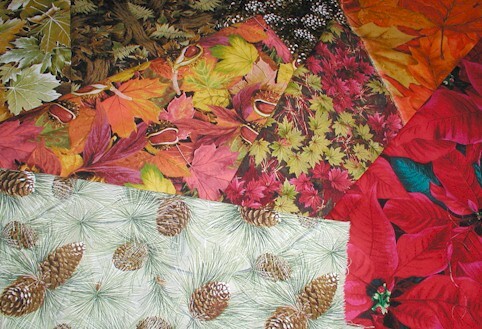 Have a blessed and fantastic autumn! 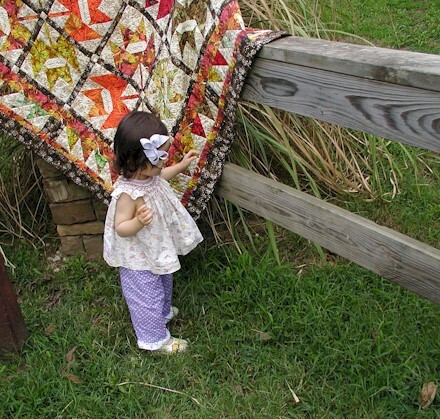 You can see my little photography stylist being hard at work, making sure that my quilt was draped just right. 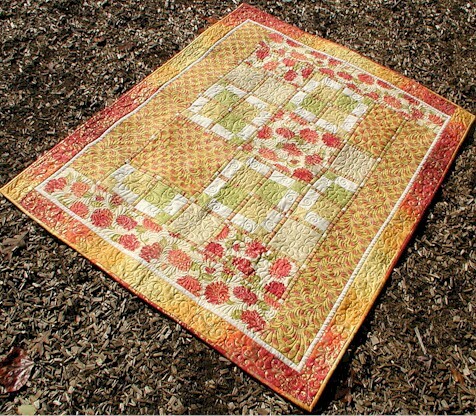 I had shipped this quilt by Express Mail to the editor because of a photoshoot deadline. 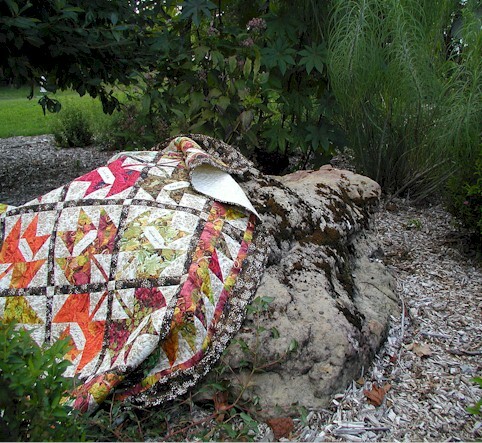 Well, my quilt was mis-delivered and as a result missed the photoshoot. 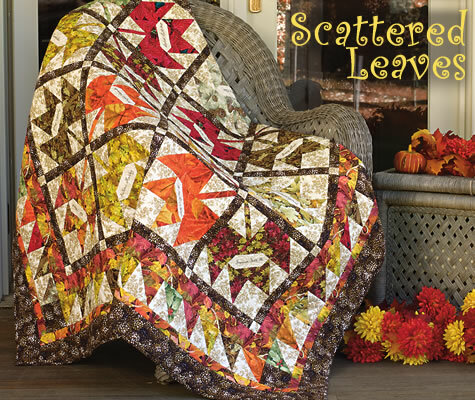 One of the editorial staff ended up having to drive the quilt to the photographer’s house to get him to photograph it for the October/November lineup. 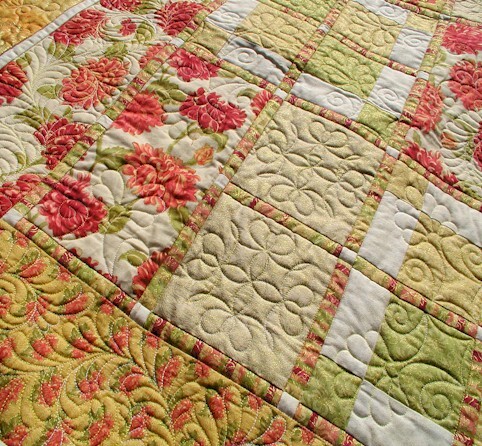 I was touched to hear about the behind-the-scenes dedication of the staff at The Quilter. I am now even more appreciative of the editorial staff with whom I have the absolute privilege and honor to work. 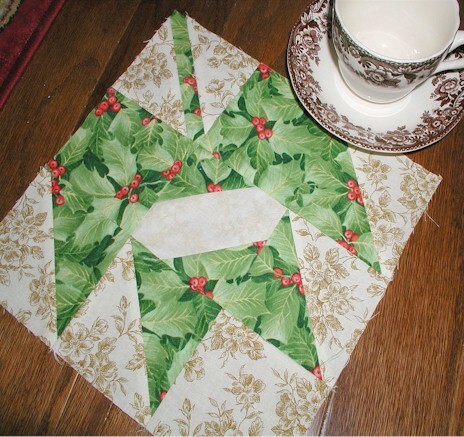 I have stitched on the blocks some favorite food items the Ivory Spring household enjoys during the Holiday Season to go with the “Autumn into Winter” fabric collection name. 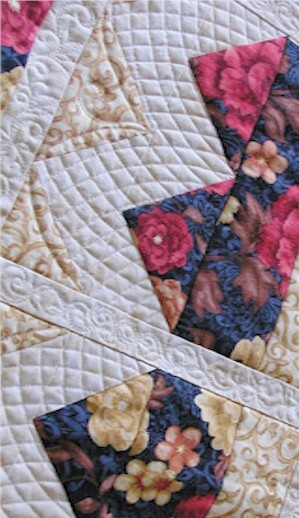 [Click here for more ideas on personalizing your quilt blocks.] 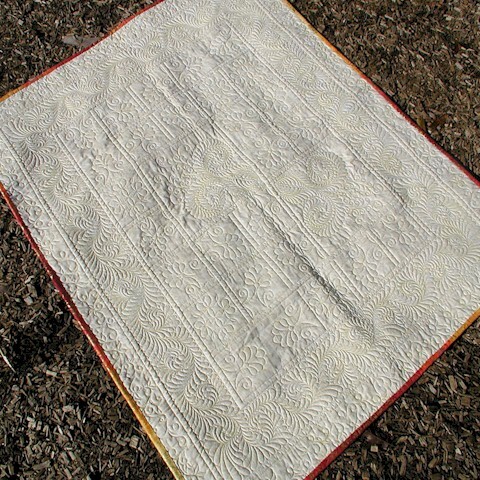 I used one strand of DMC embroidery floss stitching with tiny stitches (about the size of a single weave on the fabric). 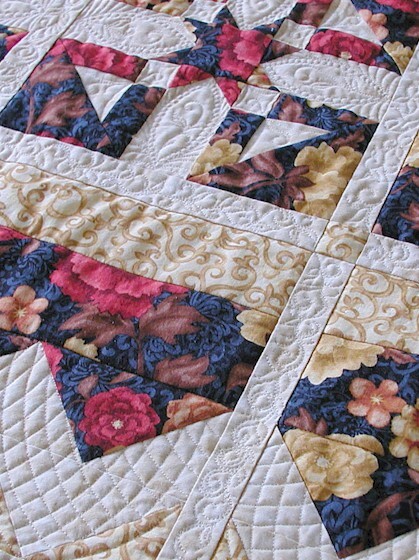 The tiny stitches make the cursive words flow much more smoothly. 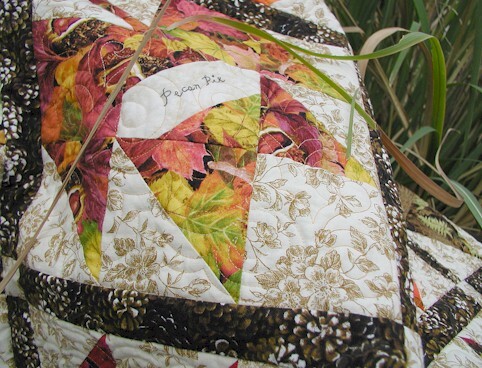 The quilt was made with fabrics from RJR‘s Autumn into Winter collection. 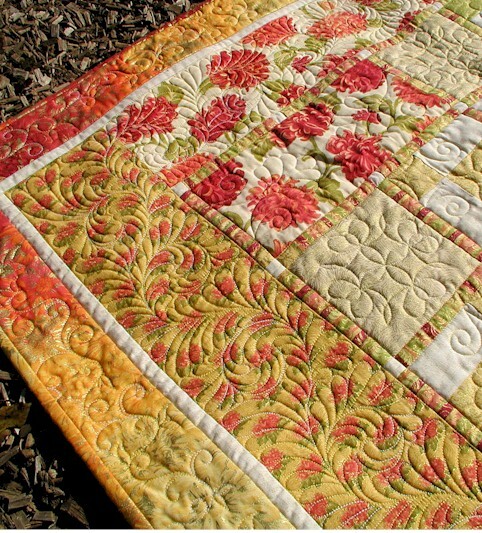 I used almost all the fabrics in this collection for this quilt to give it a scrappy look. 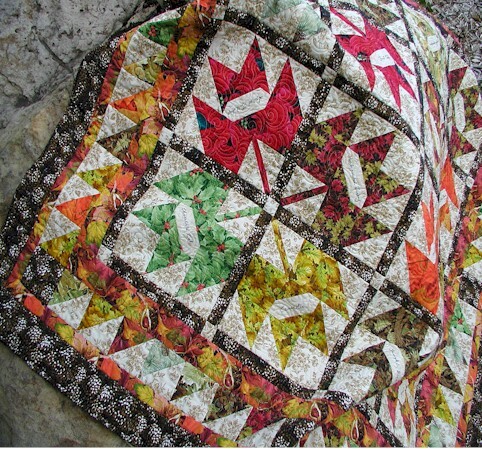 Scattered Leaves was quilted using my domestic machine with Aurifil‘s Mako Cotton 50 threads of different color to match the different fabrics over Hobbs‘ Tuscany Silk batt – absolutely bliss, I tell ya! 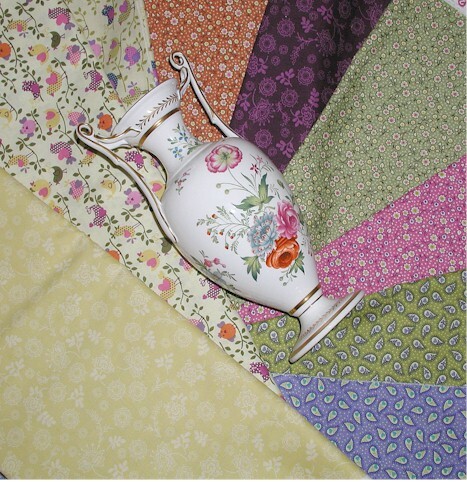 Kits for the quilt are available from Quaker Town Quilts. 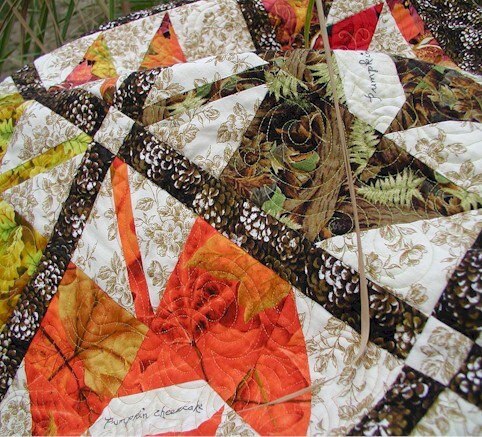 Ellen (no blog) left this comment on a previous post about my Scattered Leaves quilt that just leaves me feeling warm and fuzzy. 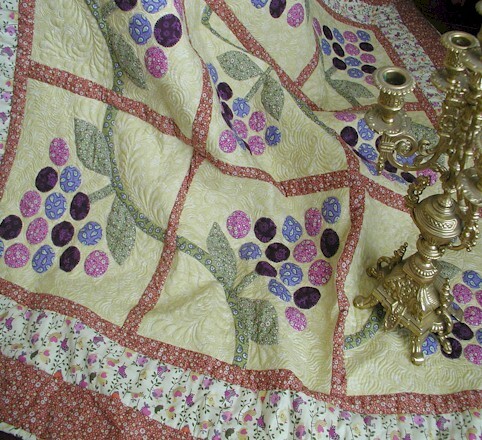 I am all about heirloom. 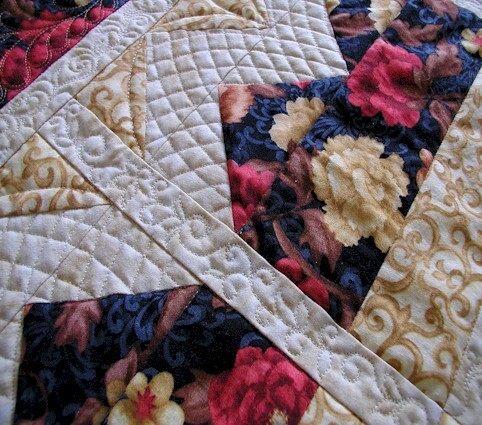 To hear that someone is graciously including me in her family’s tradition just made my day. Thank you, Ellen. 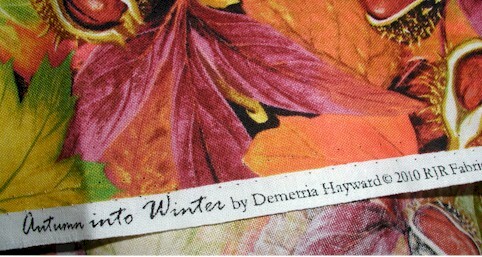 I will share some of the recipes on this blog in a few weeks when the weather gets colder. Meanwhile, I am going back to work. 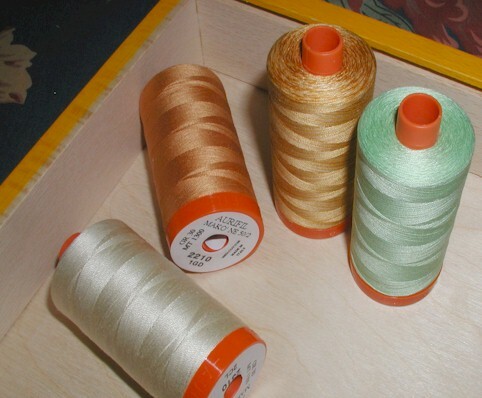 I am currently working on a SUPER sweet project. 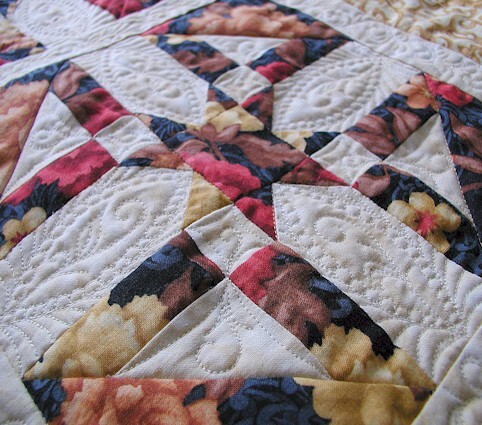 I can’t wait to show you some preview pictures. 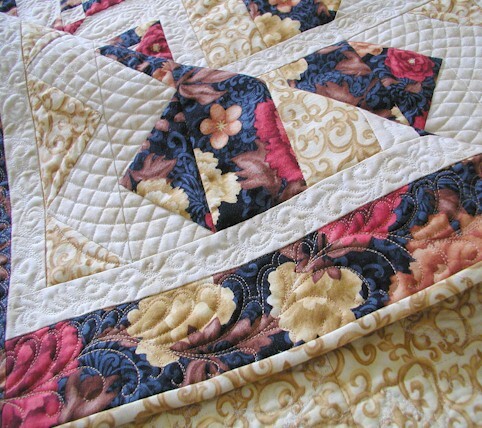 To date, having a cover quilt is the biggest tribute I could give to my quilting teacher Barbara. 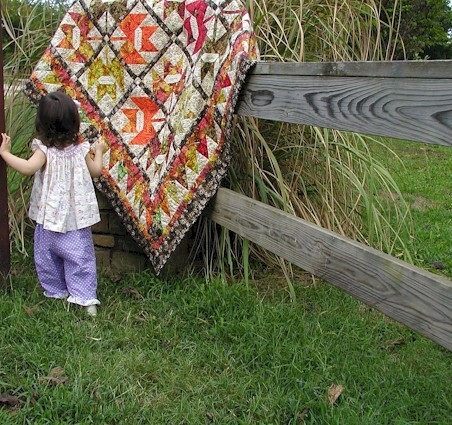 Without her encouragement from day one, I would not even dream of doing what I do in this season of my life. So, in my mind, she is right there on the cover too. 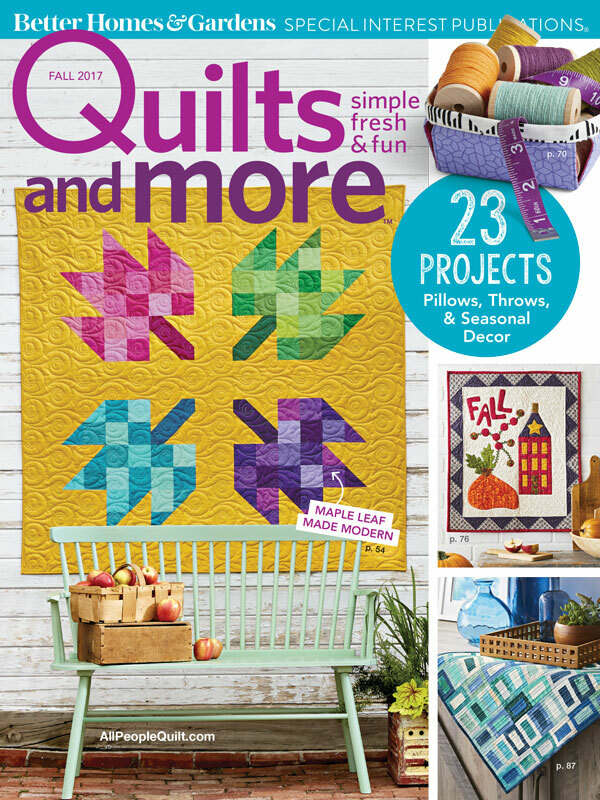 RJR Fabric Company, Aurifil and Hobbs also made the cover. 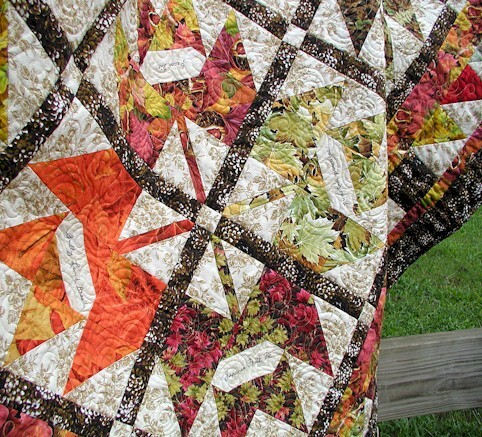 The quilt was made using RJR’s Autumn into Winter fabric, quilted over Hobb’s Tuscany silk batt with Aurifil’s Mako 50 Cotton threads. 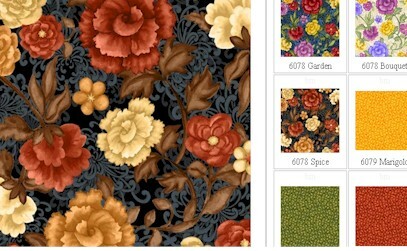 Thanks a gabazillion to these wonderful companies for making quality products that make me sing with delight! 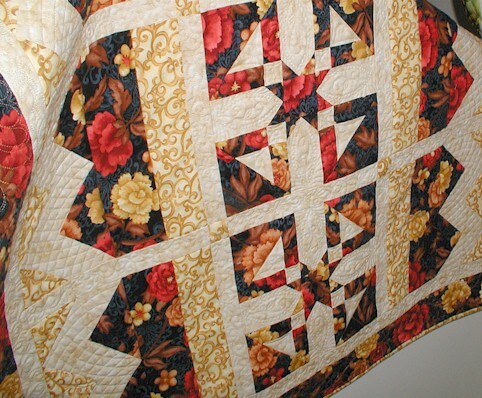 A special recognition goes to Rogers Sewing Center – my sewing mother ship. I have met the most wonderful people there. Many many thanks to my friends (including you, my bloggy friends) and family (my sister is officially my biggest fan) who have encouraged me. 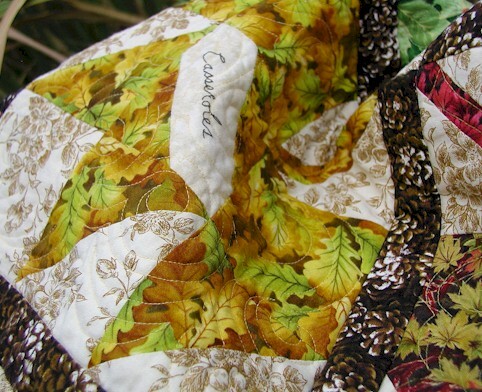 Your encouragement has helped propel me along in this quilting journey. 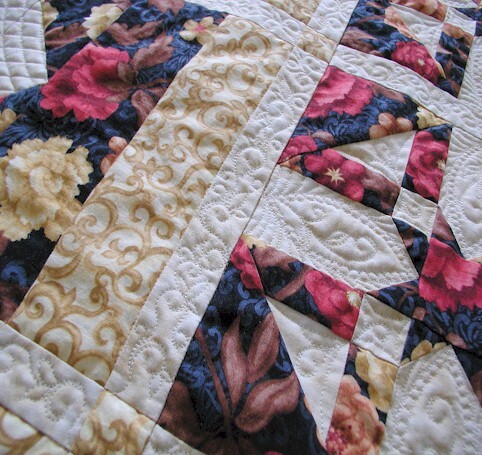 THANKS to those who write me emails and comment on my blog late in the night. Hearing from you while I am burning the midnight oil helps me stay awake. And believe me, I have had quite a few of those oil-burning nights in the last couple of months. 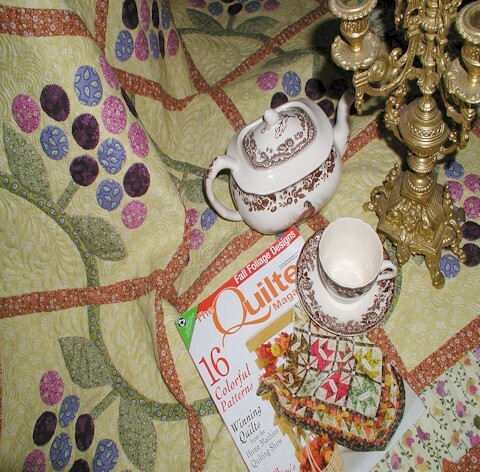 Kudos to the editorial staff at The Quilter. 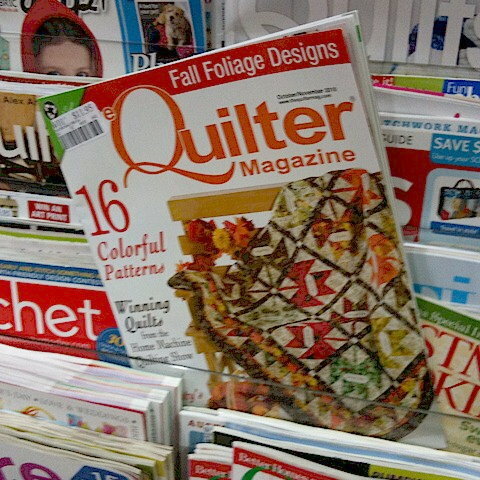 They are wonderful to work with, AND they always do a great job putting out their magazines. 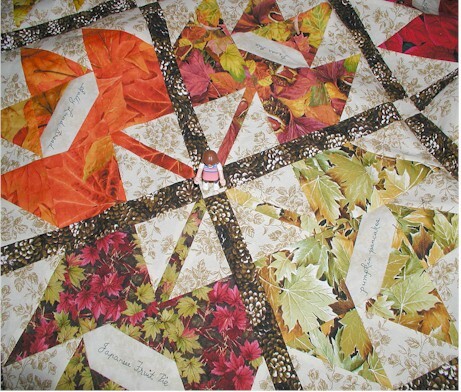 My greatest thanks to my Creator and Redeemer who has made everything beautiful in his time (Ecclesiastes 3:11a), and for making the autumn season simply GLORIOUS with the colors depicted in my “Scattered Leaves” quilt! 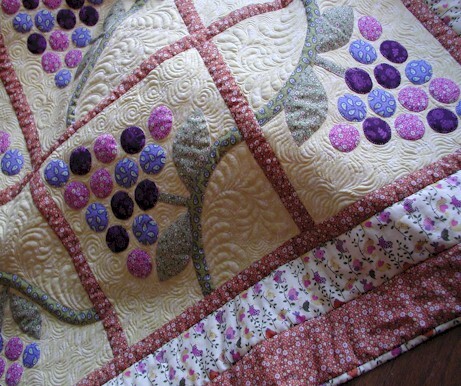 I will have more pictures of the quilt to show you tomorrow. Remember to come back, k? I’ve gotta run! See you later. 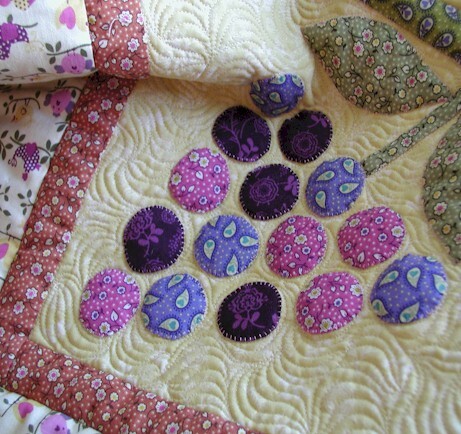 I had to make 135 circles fruits for this quilt. 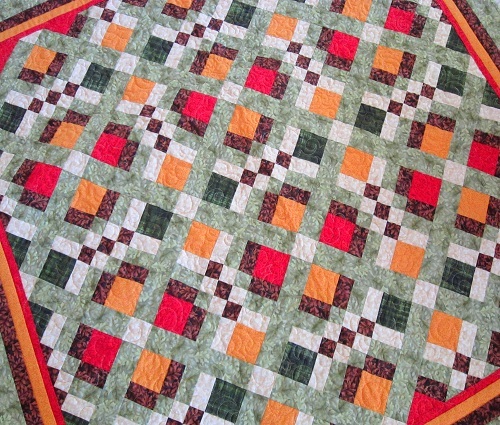 I thought I would never get done while I was working on the circles. 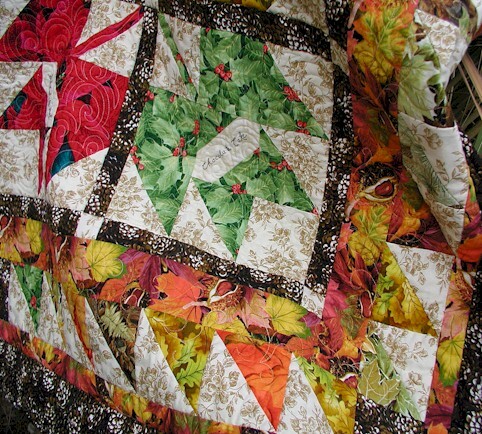 As usual, due to time constraint, I didn’t have time to mark the quilt prior to quilting. 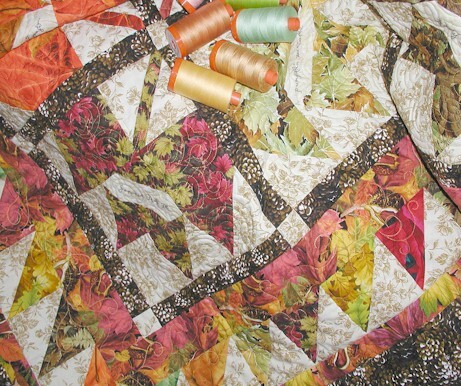 Quilting was done free-motion, unmarked and free-hand using YLI Silk 100 thread (color 239) over Hobbs‘ Tuscany Silk Batt. 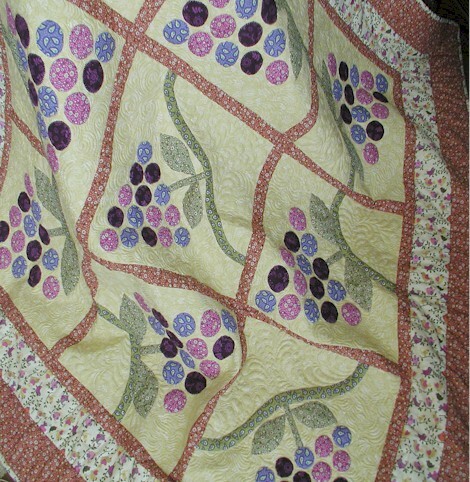 Ever since I got the quilt back from the editor, Miss Baby has enjoyed pointing at and counting the fruit. Well, she does the pointing, and I do the counting. 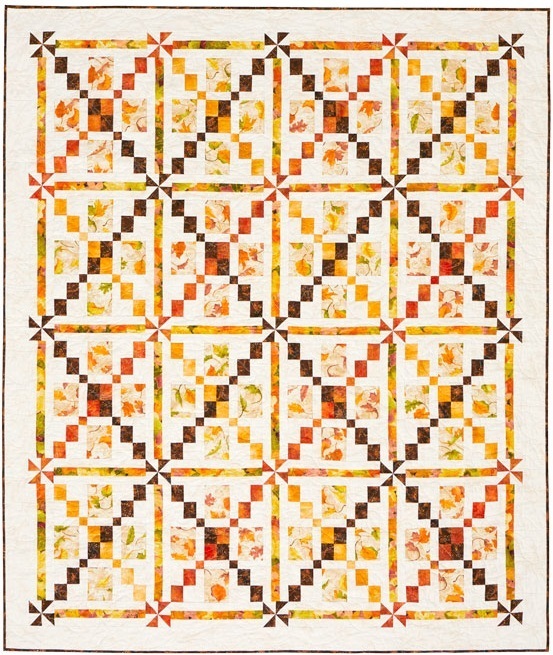 Instructions to make the quilt are found in the October/November 2010 issue of The Quilter. 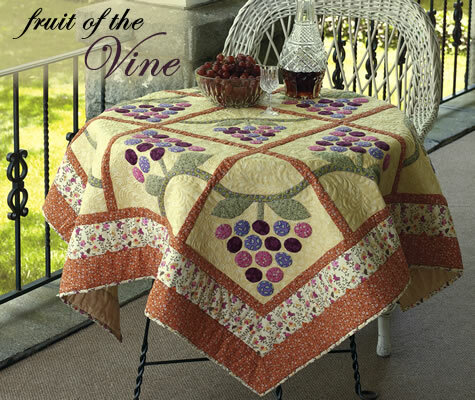 Kits are also available from Quakertown Quilts. Thanks again for stopping by. 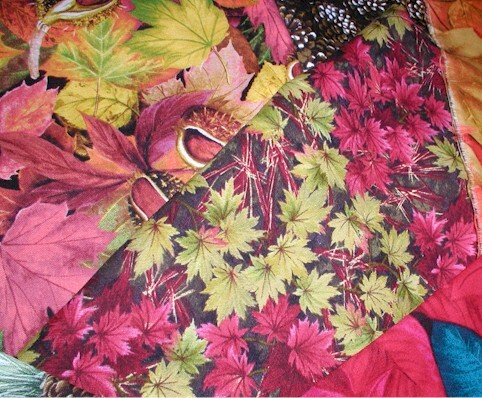 I always enjoy your visits and comments. Have a wonderful day.